The internet was very spotty in Jaisalmer and I am posting this from the Taj in Jodhpur. I added some pictures to the previous post. In the morning there is no power in our hotel from 6am to 8:30am. At least this is what we were told. In actuality the power came back on about 7am. 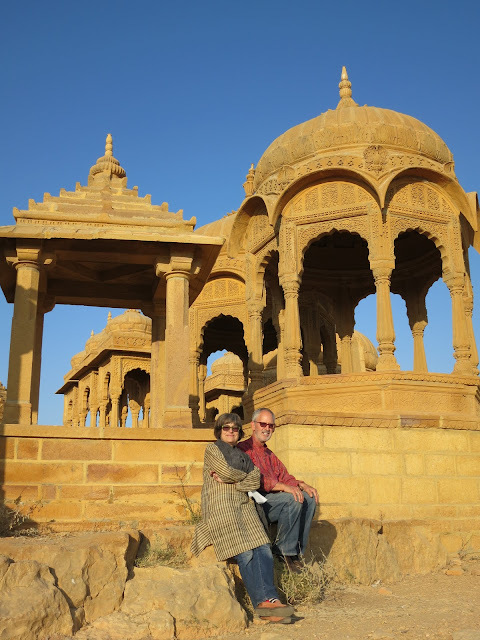 After breakfast we met our guide to the city of Jaisalmer, Ganesh. Genesh took us walking around the city both within the walls of the fort and outside. We started by visiting a Jain Temple. I have never met or even heard of the Jain religion until our first visit to India. These are very devout people who are strict vegetarians, won’t eat any vegetable grown under the earth (like potatoes and Onions) and often wear masks so that they don’t inadvertently inhale an insect and kill it. 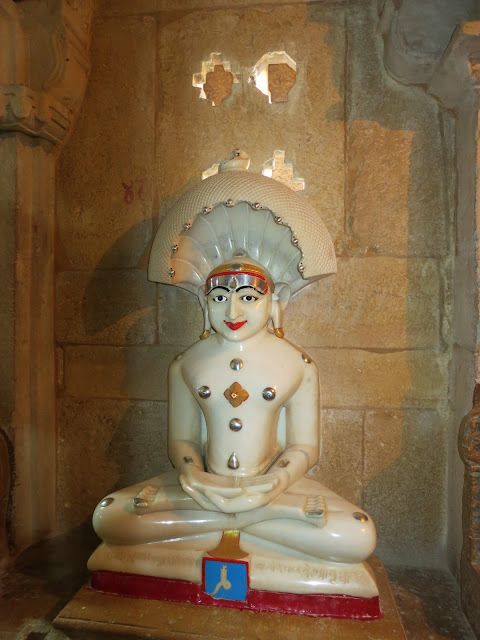 Jain temples are always white and intricately carved with idols of the Jain Saints. The religion has many strictures, but interestingly none against making money! Many Jain’s are quite wealthy, and in spite of the Indian sport of bargaining, they never bargain. Over 3500 people live inside the fort and we walked gingerly around the many cow patties (there are probably as many cows as people in the fort). Even though the city is quite commercialized towards tourists, it is amazing to look in the doorways and see the homes of the residents of the fort. The fort, suffers from a major water problem, as tourists have come to the fort, they consume more and more water. The wastewater is actually undermining the foundation of the fort and must be dealt with. Several of the mansions of the very wealthy merchants are now museums or otherwise open to the public. This fortress city was on the Spice Route and the Caravans of traders that came to this city made it extremely wealthy. These old mansions are a reflection of that wealth. Some of the families still live in the mansions as they have for generations. We visited one such mansion that is been in the same family for generations and the owner is a goldsmith. B.D. Soni, is the current head of this renown family of goldsmiths (Soni means Gold in Hindi). 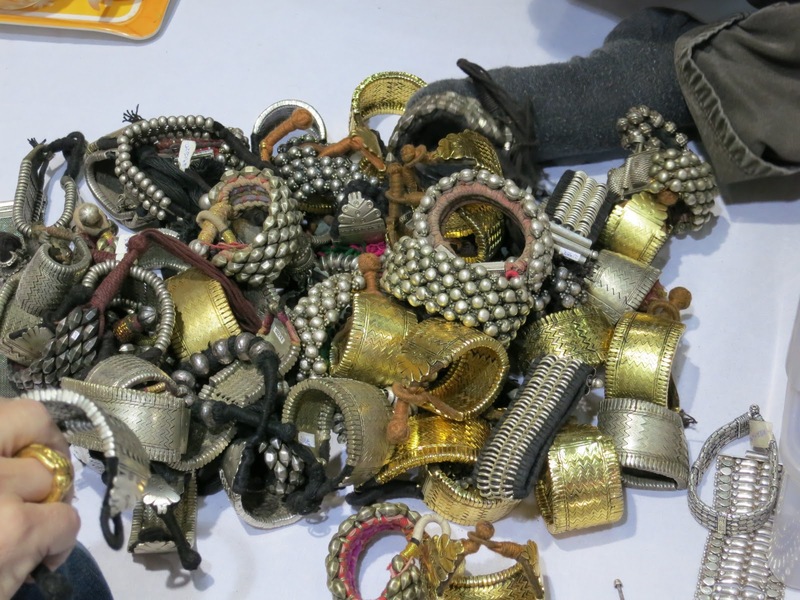 In the basement of his exquisite Havalli, he dumped out large bag after large bag of gold and silver antique jewelry out on a super large mattress. It was an amazing display of wealth, and it felt like we were playing with toys, not precious jewelry as we fondled and played with the thousands of pieces. After the requisite drinking of tea, negotiations began. Eventually we decided upon some pieces and a price was struck. I sort of like bargaining. I paid the bill with a credit card. He then asked for a passport (a not uncommon request for a credit card sale). I had left the passport at the hotel. He then asked for a driver’s license. Knowing I would never, ever, under any circumstance be driving in India, I left my drivers license back in the states. He then asked if I had any picture id. I told him I had my California Medical Marijuana Card, which is a picture ID allowing me to legally buy Pot in California. He said ok, and used it. I thought of it as a most unusual use of the Medical Marijuana card. But in India, where Bhang and Opium seeds are legally sold, not so unusual I guess. We then visited a few textile shops and drove to the artificial lake that used to be the main source of water for the fort. 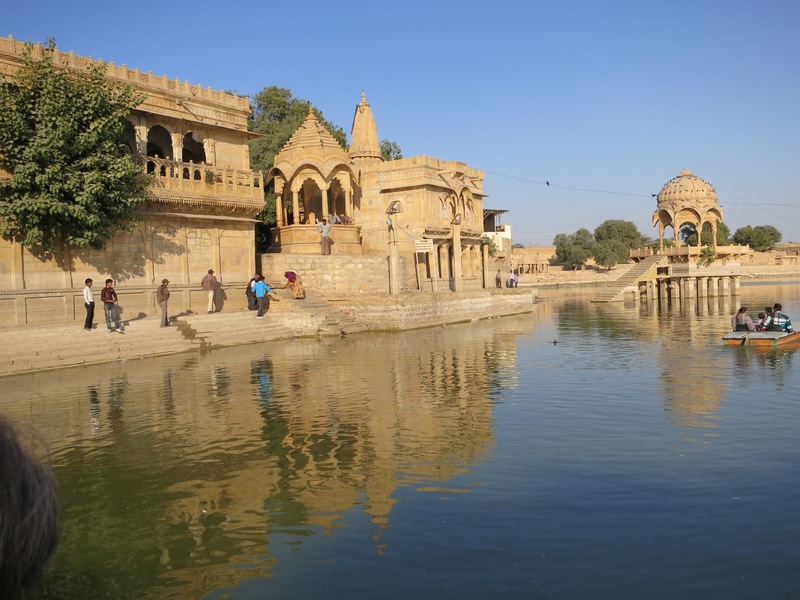 It is quite beautiful with stairs leading down to the water, viewing areas in the middle of the water for the exclusive use of the Maharaja and his consorts, etc. It is no longer used as the water supply of the fort but it was wonderful. From there we went to the cremation area, there had recently been a cremation and you could see the remains of the charred bones. It wasn’t at all gruesome or macabre, just the way that Hindu’s accept death. There were monuments to deceased Brahman’s that were elaborately carved. Finally we went to an old observation post that overlooks the fort. It was an ideal place to watch the glorious sunset reflect itself on the fort. A bottle of wine was secured and we spent about an hour watching the sunset. 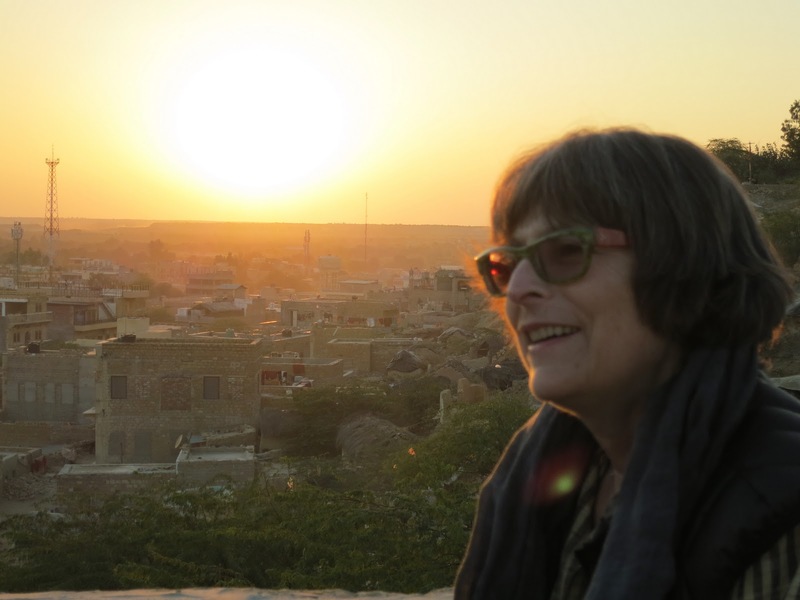 There is something about a sunset in India, I think it is because here, in Rajasthan, the earth is so flat that as you see the sun set you can look directly at it. It is quite amazing. 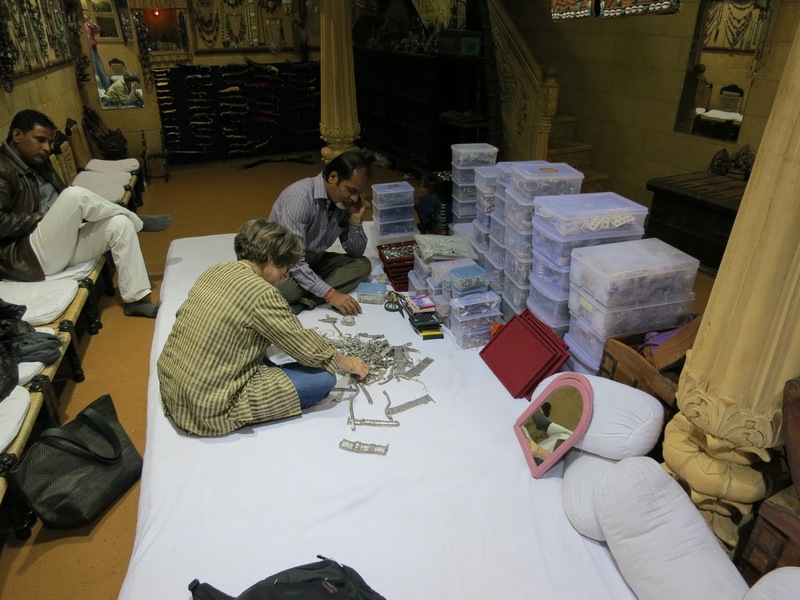 Afterwards, we had one last visit going to Krishna’s Antique Gallery a textile shop, where I set a personal, and possibly all time best bargaining, reducing the price by 60%. I actually feel that I won this particular bargaining episode. The shop owner, a very high caste Brahman, engaged us long discussions about, Hindu Philosophy, the meaning of life, and why his parents believe they shouldn’t eat onions or garlic. He won’t eat onions or garlic in front of his parents but will cook with them if they aren’t home. His brother has a license in Jaisalmer to sell Bang (a drink made using Hash) and Opium Seeds. They must have interesting table talk at dinner. He readily accepted my Medical Marijuana Card. After dinner a Tuk-Tuk back through the twisted streets of the fort to our hotel, and packing for our departure to Jodhpur tomorrow. 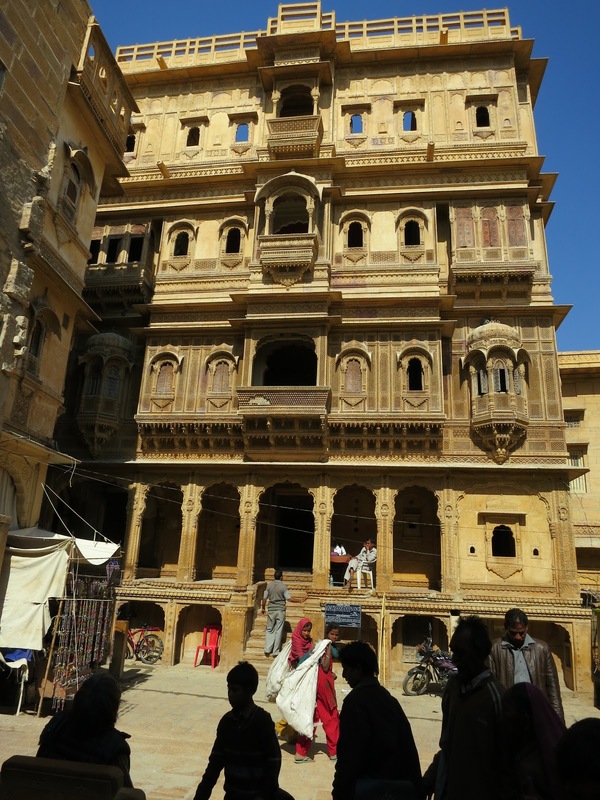 Jaisalmer, although difficult to get to, was definitely worth the trip.